Officials in Anchorage say the response to Friday’s earthquake is shifting from an assessment phase to repairing damage. That task is about to get more complicated, with winter weather headed towards the area. Though high winds and rain pummeled Anchorage Saturday night, snow is now in the forecast. The Anchorage School District has canceled all classes for the week as it continues inspecting buildings, with schools set to re-open next Monday December 10th. City Manager Bill Falsey told reporters that at this point, service to just about all utility customers has been restored. Enstar, the local gas utility, is working its way through several hundred backlogged reports of residential damage. The precautionary boil water advisory has ended, as testing has shown no evidence of any bacterial contamination in the water supply from damaged pipes. “The bottom line is that everything is working, we expect it to remain working, the water from your tap is safe for all uses,” Falsey said. 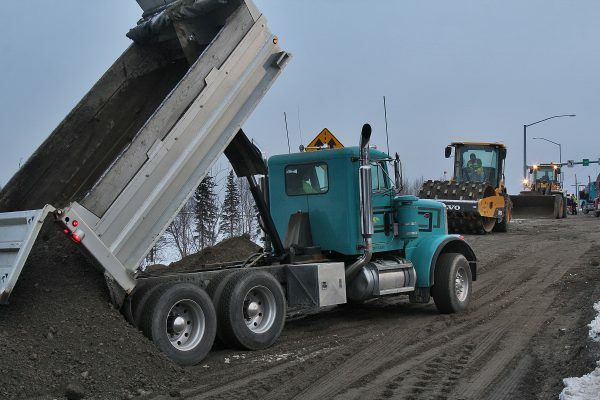 The most significant remaining problem is the highway heading north of Anchorage, connecting Eagle River and the Matanuska-Susitna Borough. “The Glenn Highway is going be a continuing challenge as we step into the additional phases of this response. If you don’t need to be on the Glenn Highway, you probably should avoid the area,” Falsey said. State offices are closed Monday in Anchorage, Eagle River, Wasilla, and Palmer. Some services at Joint Base Elmendorf-Richardson are suspended, and both military and civilian staff are being asked to check with their leadership about reporting for work Monday. Many city offices will be open to the public in a limited capacity. But most municipal employees are being asked to come to work, with the exception of residents living north of the Anchorage Bowl who would have to commute down the Glenn Highway. They are being asked to stay in place and work from home if possible. “It’s not going be a normal municipal Monday,” Falsey said. The Department of Transportation is hoping to have some of the most damaged sections of the Glenn resolved by Wednesday, but officials with the state stress that could easily be hampered by the three to six inches of snow in the forecast for Sunday night into Monday morning. Speed limits will stay at reduced levels along the roadway. The Seward Highway is open, but officials are asking people to stay off of it, as impending weather could cause rock-falls along the road. Plowing and snow removal is expected to take place as usual in Anchorage. At the Port of Alaska, ships are arriving regularly, meaning there is a typical supply of food and fuel available in the city. On Sunday morning, the Anchorage Assembly voted unanimously to extend the mayor’s declaration of a civil emergency through Tuesday night. The move gives the city more flexibility with spending and staffing. It’s not clear yet what the earthquake response means for the city’s budget, however officials expect that federal funds will be released through the Stafford Act to recoup expenses. Already, $5 million have been passed through the Federal Highway Administration to help with repairs according to Transportation Commissioner Marc Luiken. Though Saturday still saw serious aftershocks, the tremors had mostly subsided by Sunday. Anchorage Fire Department Chief Jodie Hettrick is advising residents to put some of their attention towards mental health. The city has a list of health resources available on its website. It includes practical recommendations like sticking to routines, focusing on small, simple tasks, and maintaining social connections. City, police, fire, and transportation officials all stress: with winter weather coming, and repairs still going on, don’t use the roads unless you absolutely have to. This post was updated at 6 p.m.